The trying economic times of the past few years have forced many homeowners to avoid uprooting and buying a new house by staying in their current home and updating it instead. With that in mind, you're probably going to save a lot by skipping the big move, so why not reinvest that extra cash into a bathroom vanity for your master bathroom? According to The Seattle Times, a bathroom vanity can dictate the decorative scheme for the entire room, so you don't want to settle on a simple chest of drawers with a sink. A dual-sink bathroom vanity or one with his and hers vessel sinks could be a fabulous way to redesign your space. You should also look into a wooden piece to use in your washroom. Due to the strength of modern finishing techniques, they will be right at home in this moisture-intensive area and will stay brilliant for years. You can then add matching medicine cabinets or side cabinets to improve the utility of your space. A bathroom vanity could be a quick and easy way to rejuvenate the look of your bathroom. 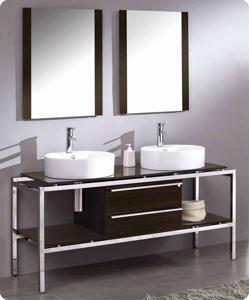 What style of vanity will work best in your redesigned washroom?